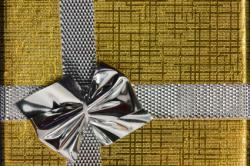 Choosing a great Christmas gift is essential, but how you wrap that present also matters. It's important to create a beautiful presentation for your gift; it should be one that shows the recipient just how much you care about him or her. A great wrapping job enhances the experience of receiving a Christmas present. Unless you have an oddly-shaped item to wrap, the basic process is quite simple. The idea is to get the paper on the present without any extra wrinkles, gaping spots, crooked areas, or other distracting blemishes. With a little practice, anyone can become an expert at wrapping. You'll also need a clean, flat surface on which to work. Your dining room table or kitchen counter will be perfect. You can also wrap gifts on a bed or the floor, but these locations can be awkward. Begin by measuring out the proper amount of paper for your gift. To do this, unwind some paper from the roll and place your gift face-down in the center. Examine the ends of your gift to determine their height. This is how much space you'll need on each end of your gift, so you'll cut the paper wide enough to accommodate the present and the height on each end. For the length, you'll need to make sure you can wrap the paper all the way around the gift with plenty of room to overlap. Adjust the gift so it is in the center of the paper. Bring one end of the paper up and tape it to the bottom of the present to hold it while you work. Pull the present down so the paper is taut. Next, fold over the other end of the paper to hide the raw edge. Pull the folded edge taught and bring it down to meet the present. Tape it in place. You may need to tape in more than one location along the edge. Turn the present so one open end is facing you. Fold the paper down so that it covers the end of the present and crease the area you folded. Next, crease each corner. Fold each corner in toward the center, creasing it along the edge. Fold up the remaining raw edge of the paper (the part touching the work surface). Then fold this entire part up against the end of the package. Tape it securely and repeat with the other end. Crease all the corners of the gift. Add ribbons or bows to your package to make it pretty. Write out a gift tag and tape it to the present. You're done! Unfortunately, not every Christmas gift comes with a square or rectangular box. 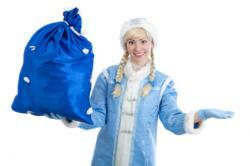 Each Christmas, you'll encounter plenty of items that have awkward or uneven shapes. Keep these tips in mind for wrapping this type of present. Start wrapping the larger end of toys and other items where one side is bigger than the other. 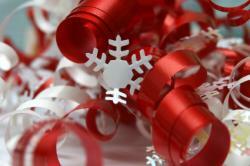 Cut the paper as if you were going to accommodate a gift that was uniformly the larger width or length. When you've wrapped the larger end, you can make subtle pleats in the paper to make it fit the narrower part. This results in a neat-looking package without any crooked areas. If you're dealing with something really difficult to wrap, a basic gift bag may be the best answer. Choose a bag that is slightly larger than your gift in every dimension. That way, your present won't rattle around in the bag or strain the sides. Wrap your gift in a few sheets of tissue paper and slide it into the bag. Then add more tissue paper to the top for a pretty look. In some cases, a gift is bigger than a normal roll of wrapping paper can accommodate. For these situations, choose an oversized gift bag, available in the wrapping paper section of most stores. 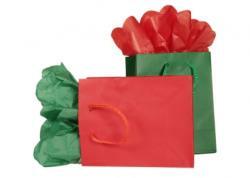 Make sure you purchase a bag that will fit your entire gift easily and that the bag is opaque. Add ribbons to make it pretty. Wrapping paper isn't always the best material for awkwardly-shaped gifts because of its stiff texture. You can also use festive holiday fabric, which you can find at most craft stores. Just use pinking shears to trim the raw edges of the fabric, place the gift in the center, and tie it up with a ribbon. You may encounter a present with lots of smaller elements or accessories. You can put all these items together in a gift bag, or you can create a gift basket with them. To use a basket, purchase one that is slightly larger than the size of all your items together. Add tissue paper to the bottom of the basket and place your items on top. 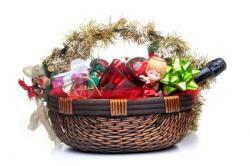 If desired, you can wrap the entire basket in cellophane or fabric. A basic neat wrapping job goes a long way toward making your gift look beautiful, but it can also act as a starting point for even more impressive options. Extra special wrapping paper, often sold by the sheet, can be pricey, but it can also elevate your gift to the next level. If you're wrapping just a few Christmas presents, this might be worth the investment. Otherwise, you could use the special paper as an accent, placing bands of the impressive paper around budget paper. You can find really beautiful designer paper at retailers like Papyrus and Paper Source. Instead of using wrapping paper, you can also present your gift in a unique container. This might be an antique basket, beautiful hat box, spectacular textile, or anything else that is lovely and special. In this case, the wrapping becomes part of the gift itself. Another great way to make your gift even lovelier is to decorate it with gift toppers. These may be crafty gift embellishments you make yourself, or they may be floral picks, Christmas ornaments, or small toys and other little gifts. Tying one of these special toppers onto your gift will add an eye-catching appeal. Ribbons and bows can really make your gift lovely. For impressive results, choose ribbons made of fabrics like velvet or satin, which are available at your craft store. Tulle also lends an airy beauty to your Christmas gifts, and you can get it in many Christmas colors, such as red, green, silver, gold, or white. A fun way to wrap your Christmas gifts is to use a coordinated theme for the paper, ribbons, tissue, and embellishments. All your gifts will look lovely under the tree together, and they'll be beautiful when you present them at your family Christmas or other gathering. No matter what type of paper, ribbon, and other embellishments you choose, putting the time into a neat wrapping job will make your gift even more special. Everyone loves to receive a pretty present.